I’ve been contemplating buying an after-market steering wheel. Mainly because I keep seeing BRZs with them and I wanted to use it as a theft detterant. Can’t steel something without a steering wheel. I mainly looked at Sparco. Then I had to sit and imagine what it would be like to drive with it. Unfortunately, I’m a creature of comfort and love using my steering wheel volume, phone, and cruise control…air bag. 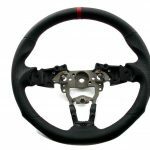 Then I started looking at Cipher Steering Wheels. I looked at them for a while…contemplated…figured out that I could not install it myself and then stopped looking. 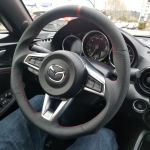 After visiting Sake Bomb Garage in Fremont, California, I was introduced to their steering wheel. 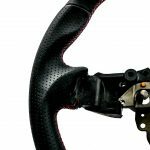 The MiataSpeed Ergo Race Wheel by Sake Bomb Garage. This wheel looks 100 times better than any aftermarket wheel that offers you to keep your steering wheel volume, phone, and cruise controls. And the air bag of course. I’m not sure what my insurance would look like if I told them I’m driving without an airbag. This model fits ND and Fiat 124 Abarth airbags and controls. They don’t sell the “diamond stiched” part as much as they should. The diamond stitch is done in the same color as the red stitching in the ND and that red centering stripe matches too. This small detail is what let me to getting this wheel than the Cipher wheel. Also, install was painless…done by a professional. I pretty much saw the wheel on site, said I’ll buy it, and they were kind enough to install it for me. You should make an appointment with Sake Bomb Garage to do the install. For the most part, I think I bought it because of the red stitching and centering stripe. Overall it looks aggressive. After driving it for 100 miles, I can say that my driving fun has greatly increased. This wheel makes me feel like I’m on a race track. For hand positions, it was like Sake Bomb Garage was reading my mind when designing this wheel. It’s thicker where it needs to be and the ergonomics put my ergo gaming mouse to shame. Here’s where I fell in love with it. I was approaching a turn and I grabbed the bottom part of the wheel. It was thinner than the rest and made it easy to slide into the turn in one quick motion. Overall, if you’re interested in getting an after-market wheel for your ND Miata or Fiat 124 and you want to keep the creature comforts of volume, phone, cruise control, and air bag, I’d go with the MiataSpeed Ergo Race Wheel. If you have one installed, write comments on your thoughts. Install is 4 because I had a pro do it for me.